I deleted Uber from my phone last night, and I think you should too. Let me explain why. On Monday, BuzzFeed’s Ben Smith posted a dilly of a scoop, quoting Uber’s Senior Vice President of Business Emil Michael, who told a fancy dinner party of New York elite that Uber could spend $1 million to discredit its critics in the press, specifically PandoDaily’s Sarah Lacy, who has written about the company’s shady tactics and misogynistic culture. But Uber wouldn’t be spending $1 million on damage control or positive PR—Michael boasted that the company could hire opposition researchers to dig into journalists’ personal and family lives, and “prove a particular and very specific claim about [Lacy’s] personal life,” Smith wrote. Through a spokesperson, Michael claimed his statement was “wrong no matter the circumstance” but that it didn’t reflect his or his company’s views. (Because lots of people say things to a room full of big shots that don’t actually reflect their views, right?) Uber basically said its judgement-impaired executive was blowing off frustrated steam and the company would never actually do that. But Uber has a pattern of untrustworthiness, so its claim is hard for me to take at face value. Even more damning in the BuzzFeed article is that despite a company spokesperson's insisting that Uber has a policy against executives looking at individual reporters’ travel data, this has actually happened—the GM of Uber NYC accessed BuzzFeed reporter Johana Bhuiyan’s profile to make a point in an email exchange with her. And Forbes reported last month how Uber’s “God View” (or a real-time map of Uber users’ location) was used as a party trick, as chronicled by enterpreneur Peter Sims, who was basically publicly stalked for entertainment. 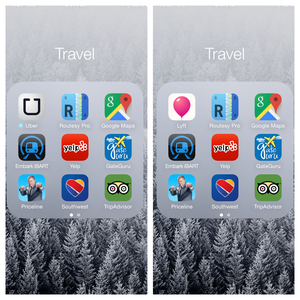 Page 1 of my Travel apps folder, before and after. Not gonna lie: That was satisfying. So I deleted Uber’s app from my phone. I tried to log in to the website and delete my entire profile, but that isn’t an option without contacting support manually and requesting a manual deletion. I filled out the support form and received a reply almost immediately. Frankly, any app that stores your personal data needs to let you delete it—Uber has my credit card, phone number, email address, and stored data on every ride I’ve ever taken. Not letting me erase that info and walk away is another huge strike against Uber. Uber isn't the only ride-sharing app, although it can be hard for consumers and regulators to determine which, if any, has the best behavior. I’ve had good experiences with Lyft, which works pretty much exactly the same as Uber, and covers 62 cities and counting. The carpool version, Lyft Line, is very affordable, and the drivers have all been friendly. Lyft’s reputation as a company isn’t completely spotless—for example, it cancelled the Lyft Plus program after convincing drivers to purchase customized Ford Explorers, although the company did offer the drivers assistance including a $10,000 bonus or help selling the car. Disappointingly, Lyft also makes you email support to delete you account. If you can handle the pink mustaches, Lyft is a nice way to ride. Sidecar is another option—I haven’t tried it personally, but I’m installing it now. (It’s always nice to have more than one of these apps on your phone, in case one is offering surge pricing, or just doesn’t have cars in your area when you need a ride.) Sidecar’s point of pride is that it lets you choose from a list of drivers, sorting them by lowest price, shortest time of arrival, or even what kind of car. It also has a ride-sharing feature to keep costs down. It’s currently available in the San Francisco Bay Area, Seattle, Chicago, Los Angeles plus Long Beach and San Diego, Boston, Washington DC, and Charlotte. Why not hail a cab? Apps like NexTaxi make hailing and paying for a cab just as easy as calling an Uber—and NexTaxi's recall option is genius. Cab-hailing apps like Curb (formerly Taxi Magic), NexTaxi, Flywheel, and Mytaxi let you store a credit card in the app so you can pay for your ride. Only they summon legitimate cabs, which are regulated by law. I’ve tried Flywheel and enjoyed how Uber-like the service was—especially since the cab drivers who use it clearly aren’t afraid of technology and won’t give me a hard time for not having cash. What do you think? Is Uber’s bad behavior enough to make you walk away?